Alright, let's try something new. Besides Disney, one of my hobbies is food and drink. Disney World has always been a dining paradise, but their drinks have never been all that good. Even in the halcyon days of the 70s, their repertoire was limited to the kind of colorful, sugary drinks you find their today - vacation drinks, if you like. Even the opening of Trader Sam's and Jock Lindsay's, with their carefully considered beverage lineup, have done little to improve the situation outside those establishments. There is a fairly good standard Manhattan, but I can make one of those at home. Making a good cocktail is a lot like cooking, and as a cook, the process is a lot of fun for me. Given the history and complexity of the lore around Walt Disney World, there exists an untapped opportunity to inspire drinks - good drinks, strong drinks, the sort of drinks Disney doesn't sell. There's always going to be the sort of Disney fan who turns their nose up at drinking - it sullies the air of family frivolity for them. And, to be fair, nothing spoils at day at Epcot like walking past a pile of passed out drunks as you leave Epcot. But after all, Walt sucked down Scotch Mists - 2 shots of Johnny Walker Red in a highball glass over ice diluted with club soda, if you must - and drinking plays a prominent role in classic Disney attractions and humor. There's obviously Pirates of the Caribbean, but the ghosts in the Haunted Mansion are tipplers too. There's Big Al, six sheets to the wind on corn liquor, who falls over drunk at the end of the show, and the Jungle Navigation Company, who have their own depression-era still. Not surprisingly, Marc Davis liked his drinks in all shapes and sizes, and it's hard to pay a visit to Alice Davis without getting a drink shoved into your hand. That's just the way they did it in their generation. So why not take some inspiration from Disney History and try to whip up some drinks? Which is what I've been doing, for some time, to varied success. I'd like to share my best effort here. Not surprisingly to anybody who's read this blog before, it's based on the Haunted Mansion. I call it the Howling Dog Bend, and even if you have no intention of ever making one, I think any theme park fan will enjoy reading the rationale behind it. The first consideration should be what type of drink are we making here? Disney has built attractions and facilities which can slot into every period of American history - to colonial taverns to ultramodern high-rises. What would a drink from the Haunted Mansion look like? Well, it would certainly have to be a stirred drink. Cocktails don't predate the Civil War by much, and the first book of drink recipes dates from 1862. In attempting to date the Haunted Mansion, 1840-1860 is a pretty good guess as to when a wealthy family would have wanted to build a fashionable neo-Gothic country estate; the house of Joel Rathbone, designed by A.J. 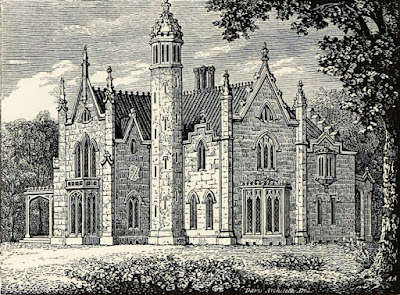 Davis and the unambiguous stylistic source of the Haunted Mansion, was put up in 1840. If you're not hip to cocktail lingo and you've always wondered why James Bond orders his martini shaken, not stirred, it's because those are the two main ways to build a drink. Stirring, as can be expected, is the original: you dump your ingredients in any old cup with some ice and stir them together until smooth. All of the ancestral cocktails are stirred: the Old-Fashioned, the Manhattan, the Martini, and the Collins. So what we're aiming at here isn't the sort of historical cocktail that became popular in the 1880s: the fancy, fruited, shaken drinks that reigned until World War I. What we're aiming at here is something elemental, something nearer to an Old-Fashioned: spirits, ice, and a little bit more. This template will guide us in creating the rest of the drink. The base spirit determines all of your other choices here. Given that we're working off of the Old-Fashioned template, using the oldest, most prestigious American spirit of all - bourbon - makes sense, right? Well, hold on. Bourbon may be one of our national treasures, but there's a reason the cocktail was invented in the first place. In the nineteenth century, and especially amongst the landed gentry, bourbon was considered to be a coarse, crude spirit - and perhaps, in those days, it was. Bourbon was so notoriously unreliable and often watered down by distillers that politicians instituted a 1897 act which allowed distillers who produced whiskey in one location, aged at least four years, and bottled 100 proof to place a special government-approved label on their liquor to signify it as the good stuff. You can still see the label "Bottled in Bond" on whiskeys today, even if no modern industrial whiskey producers are selling colored water anymore. So for various reasons, anybody with enough wealth to construct a fake castle in the country would be unlikely to be stocking bourbon in 1860. The truth is, wealthy families would have had the money and the means to buy the good stuff - and at that time, that meant wine and brandy from Europe. So our base spirit here is Brandy. You can use Cognac - which is just brandy from a specific region of France - and both Hennessy and Courvoisier work well here. But I've also used cheaper European brandies like St. Remy, or American brandies from California. If you have the nice stuff it lends a smooth depth and complexity to this drink, but it works even with entry-level brandy. Now we add the bits which make our glass of brandy into a cocktail. 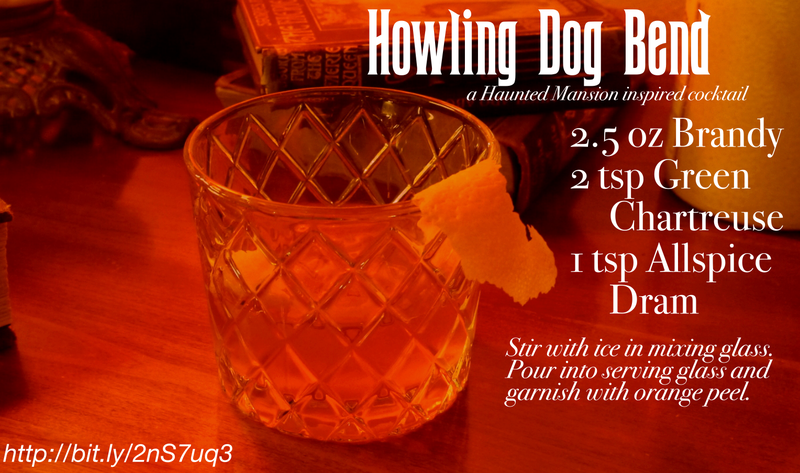 We are, after all, building a drink to honor the Haunted Mansion, and since we're not going in the direction of a glowing blue or green drink, there needs to be something to add a bit of Haunted to our house. 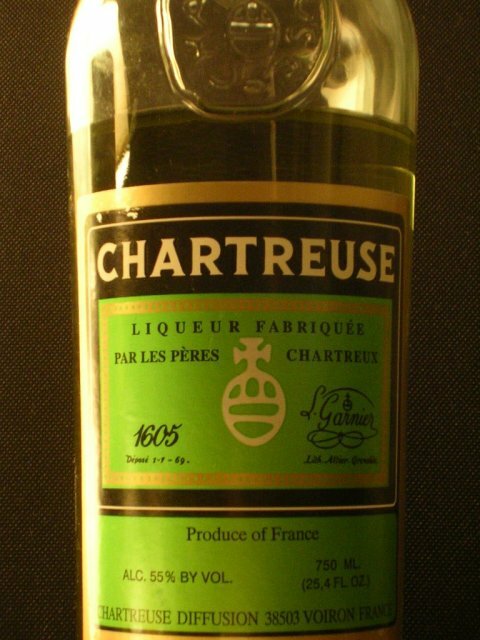 I chose Green Chartreuse, which is an herbal liquor made by Carthusian monks in France. Taken on its own, it's redolent of a monastery - funky vegetal herbs, cold stone, ancient parchment. Mixed into Brandy, it adds an air of mystery and age - a sense of decay. This is a drink appropriate to enjoy in a crumbling Gothic house. Green Chartreuse is part of a family of sweet herbal drinks of which the most identifiable on these shores is Jaegermeister. The monks have been bottling this drink since the mid-1700s, but their claim it's based on a recipe from 1605, so we are definitely talking about something the Graceys could have purchased were they so inclined. 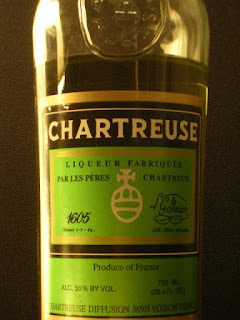 Best of all, Chartreuse is sweet - sweet enough to negate the need to add sugar to the drink, streamlining the process. I prefer the Green Chartreuse, but a milder Yellow version is also available if you're the type who keels over when exposed to bitter flavors. 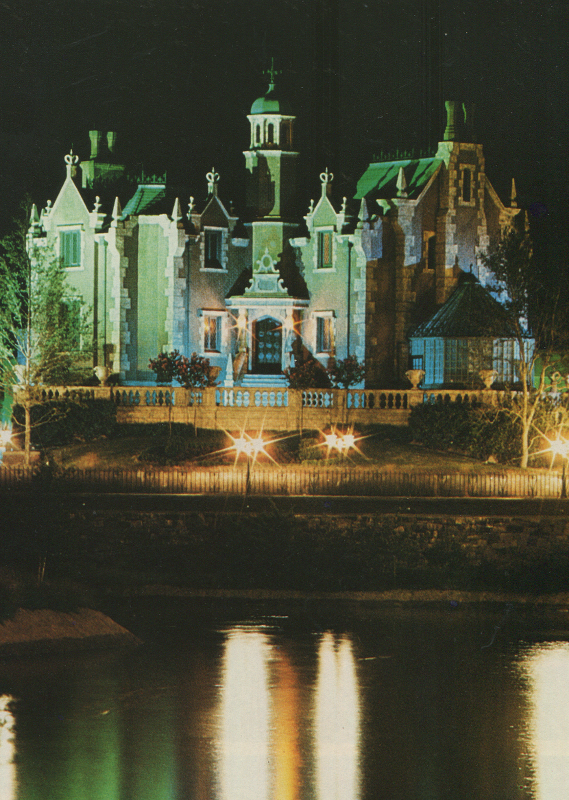 I'll stick with the green - after all, it's the official color of the Haunted Mansion, splashed all over the cast costumes and merchandise. Bottles of Chartreuse are expensive, but a little goes a long way, and smaller size 375 ML bottles can sometimes be found. All cocktails have bitters - it's the thing that made spirits into cocktails back in the 1840s. Prior to that, Angostura Bitters enjoyed a fad as a miracle cure-all before being publicly renounced and added to spirits. You can imagine the horror of some in the public - dumping quack medicine into cheap liquor to improve the taste of both. It still works - Angostura Bitters are the salt and pepper of the bartending arsenal. Angostura works fine in this recipe, but it's formulated for something even better if you can find it - Pimento Dram, or Allspice Dram. A mixture of allspice berries and rum, you can dump this sweet, spiced booze into practically anything and turn it into a drink redolent of Christmas. Originally from Jamaica, locals mixed this up themselves as a sort of local aphrodisiac and cure-all in the humid tropical climate. It's hard to find in this country now, never mind in the Victorian era. And yet, if we read between the lines, from the hurricane glass chandeliers to the widow's walks on the roof, it's pretty clear that the Haunted Mansion was owned by a seafaring family, and Jamaica was one of the primary ports for Caribbean trade in those days. Americans had been getting rums, exotic fruits and spices from the Caribbean since before the Revolutionary War, and it is not outrageous to speculate that the Graceys could have had a supply of Allspice Dram available to them. In modern days, you can make your own, or buy the excellent St. Elizabeth brand. If you prefer your drinks iced, everything can be mixed together right in the glass you're going to be serving it in with a few ice cubes until nice and smooth. But this drink is so dark, musty and complex that I like to drink it chilled and neat. If you follow my plan, you have to combine everything in a mixing glass, stir it with ice, then strain it into a new glass. Either way, this is a drink you should expect to spend some time with. The sweet herbal notes and spice flavors poke up above the smoothness of the brandy at first, then recede into the background to add a sense of mystery and age. It's the sort of drink to be enjoyed by a fire with a book of ghost stories in one hand. The iced version will dilute and sweeten as the ice melts into the cocktail, and the neat version will warm and gain complexity as time passes. Oh, and a garnish? It's not necessary, but I like to add a bit of orange peel. It may now be occupied by a coffin, but the Graceys kept a greenhouse, which in those days primarily existed as means to grow valuable oranges and lemons in cold northern climates. Besides, the orange peel acknowledges the real-world location of the Haunted Mansion in Orange County, Florida. All you need to do is cut off a thin 2-inch piece with a fruit peeler, rub the cut side on the rim of the glass, then dump the peel into the drink, allowing its oils to spread over the surface. There's nothing better for a dark night in a musty old library. I can hear that organ playing now. If you enjoyed this, let me know in the comments, and perhaps I'll do more in the future. And so, let's have a drink on it! This looks like a fun topic. I'll have to try making some. BTW The California park is in Orange county also. So a Caribbean Grog? or other run drink. Bourbon might work for frontierland or a legal moonshine. I loved this post! I was just thinking... maybe I should make this, and then re-read some of your HM posts from the past! Would love to see not only attraction themed cocktails, but also hotel themed (Contemporary, Fort Wilderness Campground). I love your work, and really appreciate your perspective, your thorough nature, and your style!! I love this idea, being a fan of the Tiki drink crazes and other 'themed' cocktails over the years. Please PLEASE do more. This is a wonderful idea. It's very cool how you weave your knowledge of Disney lore into the exploration of the appropriate drink. I now need to find a way to get allspice dram. It seems essential for the flavor profile you describe. Also after the long hiatus on your blog, I was missing your incredible writing. Welcome back!!! Thanks for your post! I have to ask: where do you recommend that someone gets ingredients such as Chartreuse Green/Yellow, if they aren't carried at any local stores. Thanks and thanks again for all your wonderful writing! Nicely done! I could definitely see a whole book of drinks like this- everything from tiki drinks for the tiki room, tonic for the jungle cruise, Caribbean rum for the Pirates, and maybe a Carousel of Cocktails through the decades for the CoP. Nice cocktail and tribute to the Haunted Mansion! Seeing as I already had all ingredients on hand, I made it as prescribed and it's delicious! Of course, in my book just about anything with green Chartreuse or allspice dram is going to be good. A variation on it to try would be the same, straight up in a cocktail coupe with pimento bitters and possibly even orange bitters. I'll give that a go next time. And fyi - There is a merry band of us cocktail, Tiki and theme park enthusiasts in Orlando. Please join us if you like! Here's a photo of your cocktail in my home bar, the Cannibal Lounge. Cheers! Fine idea. Looking forward to seeing/sipping more of these. I have two humble requests: A drink called the Goat Trick, and also one that favors maraschino, because I have lots of it and can drink only so many Aviations in the course of a week. Made this tonight with ALize and we listened to the ride soundtrack while we drank it bc we are that corny. The allspice dram really takes off the funky herbal edge of the chartreuse. Please make more themed cocktails!! Just made this actually on my second. I used jagr because couldn't justify the $35 chartreuse but man is this good. Think I am going to splurge for the expensive stuff next time. Thanks and keep the drink recipes coming. 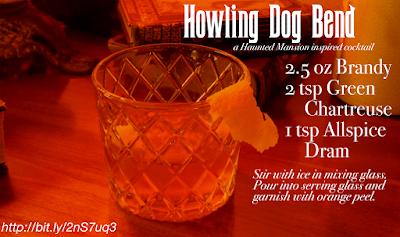 Sounds like a cousin of the Sazerac, which is perfect what with the Disneyland Mansion being in New Orleans Square. Apologies to ping you on an old article, but as a cocktail enthusiast and fan of theme park design ethos, I would LOVE to see more themed cocktails like this! More are definitely coming! Cheers!